Dear Master Cecil, is there a guide of such that the altar table is "too far" from the main door that I should build a solid wall in order to have the altar closer to the main door? The altar will be praying to Guan Yin and Guan Yu. Its about 14 feet versus 25 feet. Behind the wall of the altar, other than a bed what else I should look out for to avoid? 1. You wrote: "The altar will be praying to Guan Yin and Guan Yu." Reply 1: Please note that traditionally one is suppose to pray to ODD number of deities or gods. Not TWO (2). 2. Normally if an Altar is to face the main entrance door; it is highly unusual in a HOME to place it so far back as per your RED outline. Dear Master Cecil, thank you for the reply. Point 1 noted. Point 2, other than being highly unusual, is there any motivation for me to consider for moving it forward closer to the main door perhaps? 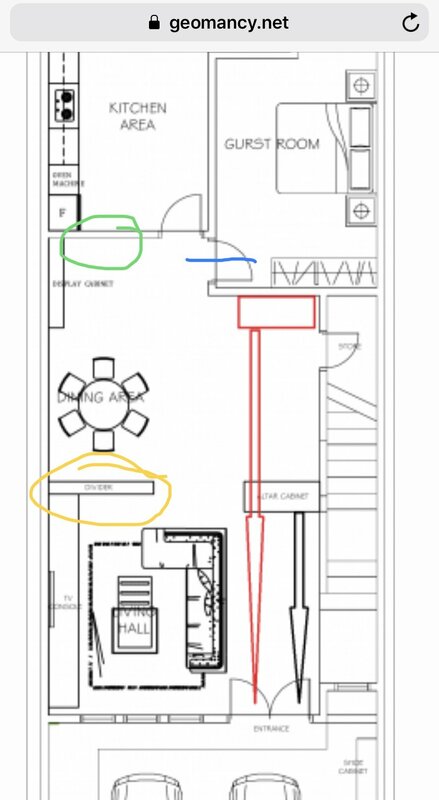 No motivation if the partition highlighted in yellow is as shown with the altar level with it.